For kids, dragons are easily the coolest monsters ever. As benevolent guardians in Disney movies, and as the most vain and evil creatures like Smaug in the Hobbit book and movie adaptation. Portrayed in Christian texts, especially in Revelation, as Satan himself: the dragon is the most despised creature, and a symbol of absolute evil. 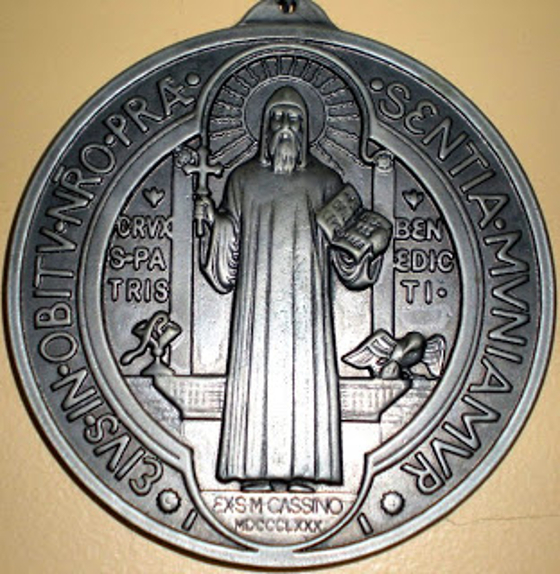 Even the prayer to St. Benedict, an exorcism prayer, exhorts that "the vanity of the Dragon NOT deceive nor waylay our faith and that the wicked one (as dragon) drink his own poison," a reference to Satanic spirits burned by their own unholy fire: their evil as their own reward. snares as the Evil One's own recompense. Unknown to the lay Christian, whose idea of what ALL angels look like is based on Catholic iconography: humanlike with wings (archangels) or children with wings (cherubim), the word "SERAPHIM" in the original Hebrew and Greek means literally "fiery serpent", Jewish Rabbis translated the word Seraphim to Drakones (δράκονες "serpents"), identifiying dragons as heavenly creatures whose job was to consume the wicked. 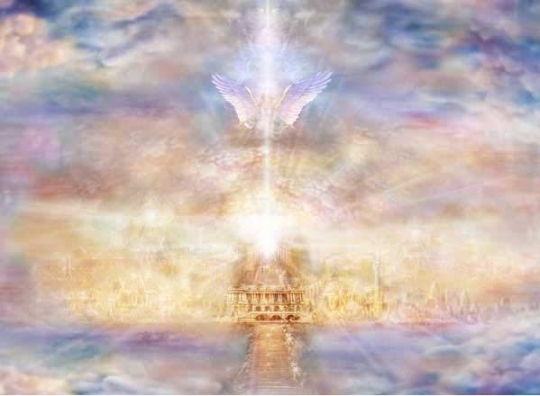 Cherubim and Seraphim are actually different from the messenger angels who are the human-like servants of the Lord. of Creation as they circle the Holy Throne of God. This is why we see dragons swallowing sinners decorating most Christian cathedrals in Europe. In church sanctioned medieval art seraphim were depicted as winged dragons. Bible covers of the time of St Thomas Aquinas show the throne of God flanked by the soul-devouring Seraph-dragon. Seraphim may also be the guardian winged Mushushu dragons that guarded the throne of God, the gates of heaven and the sacred groves of Eden. 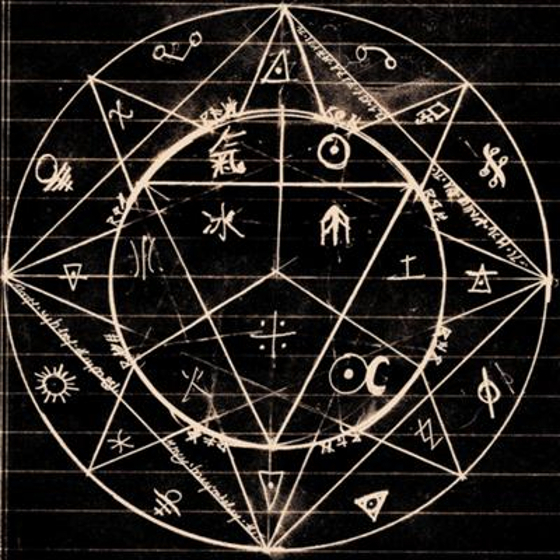 Gabriel opposing the dragon, Satan or Lucifer in sacred geometry. 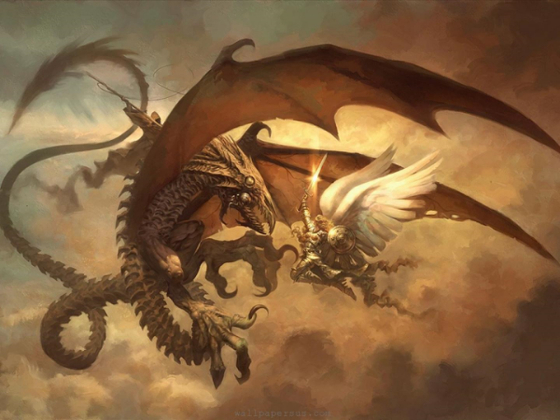 The description of Seraphim in religious texts reveal giant and fiery, six-winged dragons. Not humanoid-angels with 6 wings. A spirit creature like a dragon is believed to be the Seraphim being of fire that guards the throne of God. 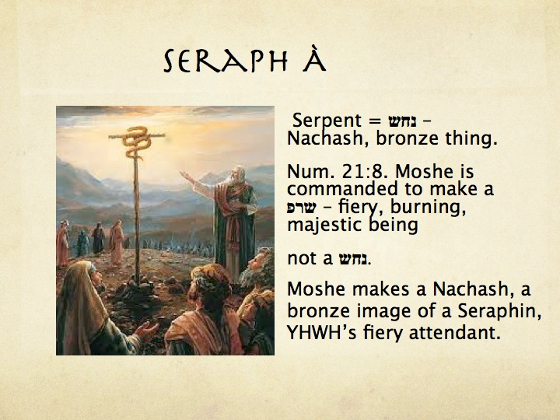 The Hebrew word "saraph (שָׂרָף)" literally "burning ones", seraphs are mentioned in the 2nd-century BC Book of Enoch, where they are designated as drakones. punished at one time by fiery serpents. The Seraphim are described in Isaiah 6:1-6 as beings immensely close to the glory of God, whose sole purpose is to display that glory. They have six wings, two to cover their eyes, two to cover their feet, two to fly with. 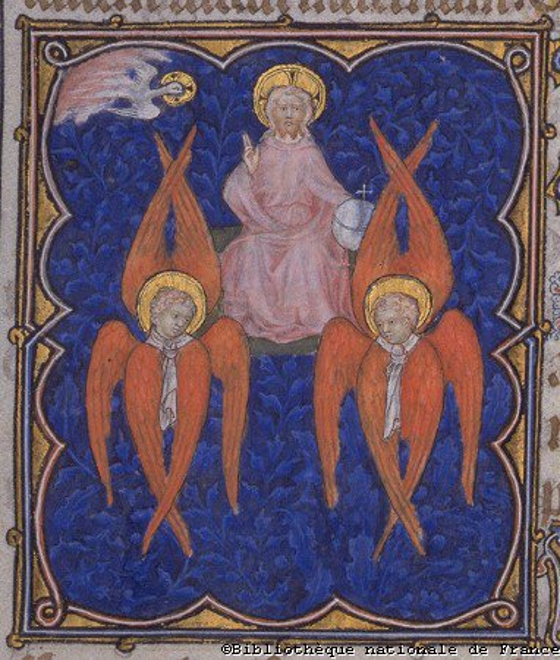 In the late 1st-century AD Book of Revelation, the seraphim are described as being forever in God's presence and praising him: "Day and night with out ceasing they sing: 'Holy, holy, holy is the Lord God Almighty, who was and is and is to come.'" Saraph is used 7 times in the Hebrew Scriptures (Num. 21:6,8; Deut. 8:15; Is. 14:29; 30:6; and here twice). In the Book of Isaiah, it is translated as "fiery serpent." In Isaiah—14:29 and 30:6—those "fiery serpents" or seraphim are described as flying. From Summa Theologiae by St. Aquinas, "The name Seraphim is expressed by the word "ardor" or "fire" Saraph in all its ancient use as an archaic word describes a burning, fiery state. Seraphim, are classically depicted by their having six wings radiating from the angel's face at the center." St. Thomas Aquinas describes Satan, "This DRAGON which Thou hast formed, he who was more excellent that all the rest in nature, became the greater in malice." Christians of the period as a powerful shapeshifting dragon. The curse which Creator YaHuWaH placed upon Satan was not literally turning him into an earthly snake with no wings (for he was Fiery Seraphim that once flew), but rather, to be trapped in a lower dimension, deceived by his own vanity and deceiving others, doomed until Judgement Day when he is cast into the Lake of Fire forever. As a saraph, ranked the highest among the angelic hierarchy, Satan blinded by pride, greed and ambition, loses the the Holy Fire of the Lord, a blessing which empowers the champions of the Lord to defeat any unholy enemy and do the Lord's will. This anointing is given instead to Michael the Archangel and his six other angels (Gabriel, Raphael, and a few others) who rise from the second lowest choir to intervene and block off an all-out assault by Satan and his seraphim choir host on the Lord's throne, all by themselves. Michael and the six lower ranked angels defeat a higher ranked Saraph (and his rebel angel host) and smite them down as 'quick as lightning striking the earth'--another Biblical reference. This lore is revealed in the Book of Enoch and other Hebrew texts about angelology. Once defeated, the Lord removes Satan's anointing as The First, and he becomes hideous and debased--his light from the Lord extinguished, even if he retains part of his Saraph powers and skills to mask his ugliness and still be able to deceive and subvert people. Wonder why serpents and dragons are so common within the ancient Biblical-Scriptures, pagan mythologies, cultures, and religions all throughout the world, spanning back many millennia? These recorded 'myths' and 'legends' are not tall tales but events as the ancients actually saw and experienced, not as imaginary creatures. This is one fact that most overzealous religious interpreters and archaeologists gloss over, some Catholic priests even warn that 'a little knowledge is dangerous,' thinking their flock to be the same idiots they are. Dangerous for them maybe, because once we recognize how glorious and magnificent the Creator is, false doctrines will fall apart and the divine truth be revealed. of this South American ancient civilization. 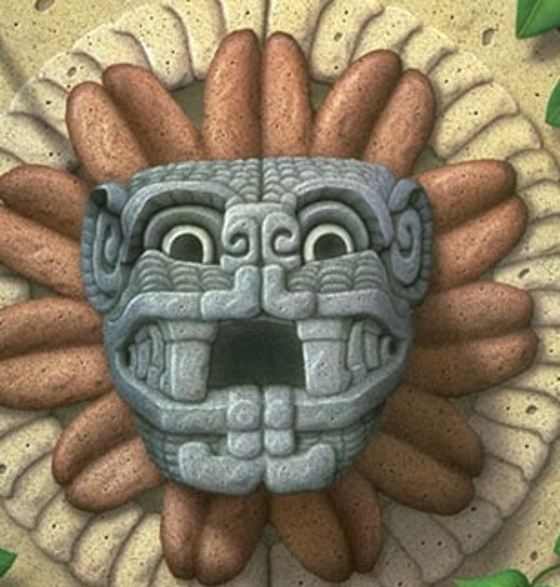 There were many serpentine or draconian 'leaders or kings in ancient times among the ancient cultures: Quetzalcoatl of the Aztecs, a feathered-winged serpent shape-shifter. The Annunaki 'Those who from heaven to earth came,' of the Sumerians were serpent-reptilian humanoid rulers. The Egyptians used Serraf in the Pyramid texts that became the Book of the Dead. as depicted in many stone reliefs in archaeological sites. 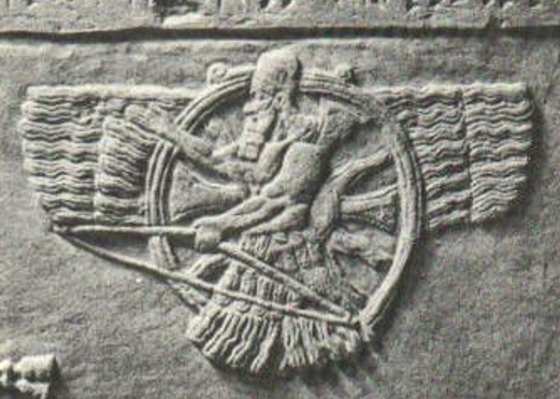 The Assyrians worshipped "Ashur", the "wing-disk god". Celtic myths warned of serpents and dragons visiting and bringing widespread infertility and strife. In Greece, their first king was "Cecrops", a half-man and snake. Greek mythology makes mention of some of the titans/gigantes who were winged half-man and serpent beings. science of Feng Shui by studying the lines on the shells of turtles. 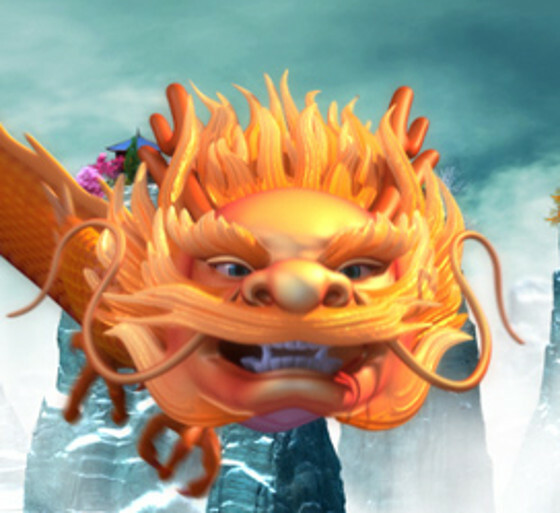 The Chinese and Japanese have the "Lon" (dragon) who appeared in physical and non-physical forms. In China, their first emperor was "Huang-Ti", a half-human and draconian, whose mother was impregnated by a beam of light emanating from the "Alpha Draconis" star. of heaven and of the past ages of the earth. The Creator may not be a serpent himself, as we ARE made in HIS image...but the presence of dragons/fiery seraphim in the world, at one time when civilizations were fluorishing may be one inescapable truth--the supposed Golden Age of Israel: the time of King Solomon, or Sulayman to the Moslems, was an age when one of the Lord's anointed kings could talk to animals, plants and command Djinn--another reference to spirits of fire--to build the Lord's temple.